In early 1996, Lin Jing, then 33 years old, had her first experience on a sailboat -- which included her first fall overboard. As she and her husband, the helmsman, were trying to lower the boat rail with a sling, she dropped it and the boat flipped, knocking both of them into the water. Despite a scratched lip, Lin didn't give up. She got back onto the boat and kept going. Since that first time out with her husband, a sailing aficionado from France, the two of them often went to sea together in a Hobie catamaran 16. "I found it was a sport that requires not only physical strength, but also a flexible strategy," Lin said with a twinkle in her eyes and lively gestures. For her, she said, it will never be boring, because no two sailing trips are the same. The feeling of braving the wind and waves made a deep impression on Lin and sowed the seeds of her lifelong obsession with sailing. That obsession has driven her onward for 23 years, leading her to take sailing voyages around the Atlantic and to Antarctica. 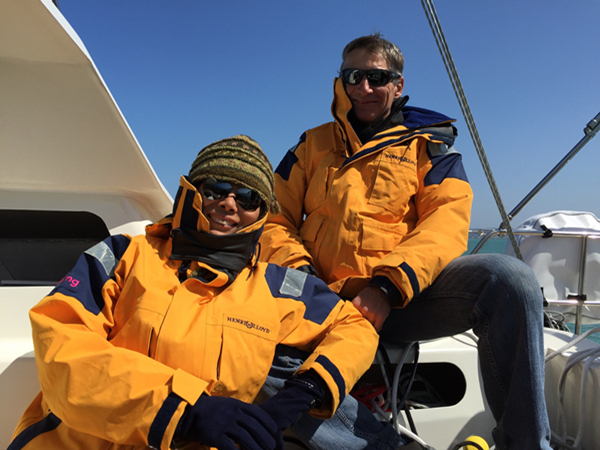 In 2001, to facilitate a transition from their small boat to a bigger one, the couple went for training at an offshore sailing school in the U.K., where Lin trained to be a "competent crew" and her husband to be a "sea master." Equipped with years of hands-on practice and now professional training, Lin and her husband set out to sea from France in 2005 in a new vessel. They named the ship Kindred Spirit, which, said Lin, refers both to the boat and to the relationship between her and her husband. On this voyage, the couple sailed around the Atlantic, taking turns on duty every four hours at night. Their voyage lasted a total of 760 days, with the longest continual stretch spent at sea lasting 23 days. During their time on board, the couple cooked and ate their meals, fished, played games, read books and shared their opinions, and quarreled at times. When she had spare time, and even when she was running on a tighter schedule, Lin always managed to write something down, at least a few lines, on her iPad. She then posted her writings on her blog. Now Lin has published a book about the voyage, and is working on another one about their second major global expedition, which took place from 2015 to 2017. On this trip, they sailed the Haiyou, whose name means "friend of the sea," to Antarctica. Lin said she harvested a great deal along both journeys -- and not only fish, either, but also beautiful scenery, genuine friendship, reflections on life and more. Compared to the more common way of traveling -- merely ticking off places on the destination checklist and taking quick snapshots -- Lin sees sailing as a slower way to travel the world. "It allows one to understand the world, to get to know the customs of different places, and to discover interesting things about them." During the first night sailing the Haiyou, Lin sat astern to enjoy the sunset during her turn on duty. She described the moment on her Chinese blog, how the sun, like a golden loop with a dazzling white dot in the middle, seemed to be chasing the boat as it moved and wavered on the ocean. As it sunk toward the sea, the sun took on clear-cut edges and a red color. It kissed the stern of the ship before disappearing into the ocean horizon over the course of several minutes, leaving a colorful sunset glow in the sky. Lin looked at her watch and saw that it was past 10 in the evening. Certainly, said Lin, there were also many challenges along the way, like surges and gales around the Drake Passage between the Antarctic Peninsula and the southern tip of Chile, as well as the extreme cold weather in Antarctica, and many others. "The sport requires one to have determination, to be able to bear hardships and endure loneliness," Lin said. The unexpected has also happened along the way, like the time they ran into a fishing net in coastal waters. But there were also unexpected pleasures, such as meeting so many different kinds of people, including other sailors and locals from different countries they passed through. Lin said she has treasured many friendships along the way as well. According to her, in such brief meet-ups, small formalities and reciprocity are required for people to get acquainted, and everyone values the relationship even when it is only a short encounter. Since her first time on a small sailboat, Lin Jing was hooked, and she has spent 23 years since then sailing around the Atlantic and to Antarctica as a global voyager.